I’m feeling fairly fragile right now because my daughter is due to start school this year while my ‘baby’ boy trundles off for the first time to kinder. A glimpse of her itsy bitsy school dress hanging ready in the cupboard – or his kinder bag by the door – is enough to send my bottom lip quivering. So goodness knows how I’ll get through their first days! I’m sure they’ll both be fine, but just in case, I’ve got us The Kissing Hand. 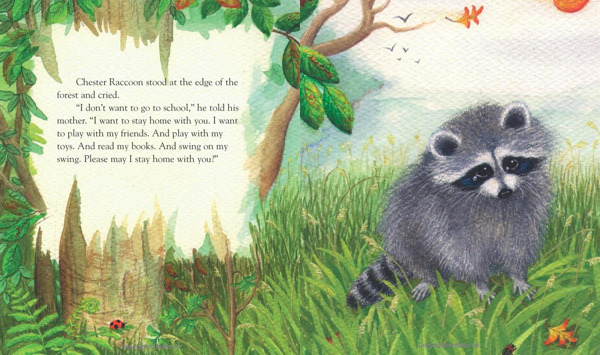 This beautiful book by Audrey Penn tells the tale of Chester the raccoon, who is slightly reluctant to start school and would much rather stay home with his mum. He’s not swayed by her promises that school will be fun once he gets there. Mrs Raccoon took Chester’s left hand and spread open his tiny fingers into a fan. Leaning forward, she kissed Chester right in the middle of his palm. Chester felt his mother’s kiss rush from his hand, up his arm, and into his heart. 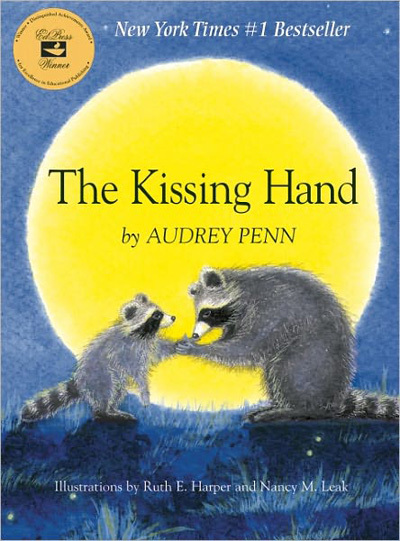 Of course, on that first night of school (raccoons are nocturnal, after all), Chester senses his mother’s own disquiet and gives her a kissing hand too. Sooki-la-la that I am, I couldn’t get through that bit, or the book for that matter, without tears welling in my eyes and that familiar pull of emotion in my chest. Parents of soon-to-be-preppies, I dare you to get through it without reaching for a tissue or, at the very least, without some rather rapid blinking. I bet you can’t! I’m certain I’ll be needing a kissing hand or two of my own when I leave my duo at school and preschool for the first time. How about you? Find The Kissing Hand at Book Depository, with free shipping to Australia. Don’t mind having a good cry over a book? Then take a look at our past review for Someday.